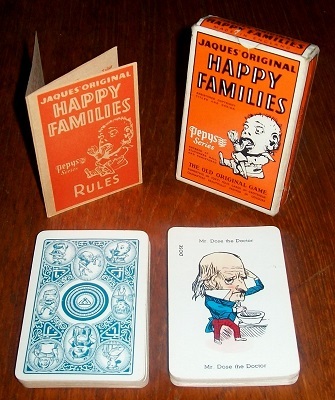 'HAPPY FAMILIES' CARD GAME: The following are the names of the eleven Families in this edition: Bun the Baker, Grits the Grocer, Bones the Butcher, Dose the Doctor, Block the Barber, Pots the Painter, Bung the Brewer, Tape the Tailor, Chip the Carpenter, Soot the Sweep and Dip the Dyer. 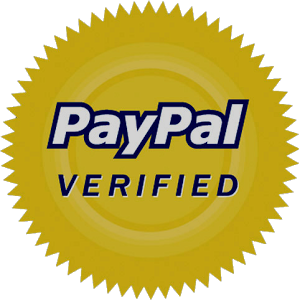 The object of the game is, firstly to collect cards from other players to make up complete Families; and secondly, to collect complete Families until one player has them all. This game is complete and in excellent condition. The box has fully retained its integrity and all flaps remain completely attached without any use of sellotape. Every one of the 44 cards presents itself in excellent condition: the colours are vibrant, the writing is clear and every card is free from spotting, fraying and tearing. The rule booklet is likewise in immaculate condition. Self-acclaimed as: 'The most popoular game ever published', this example of Happy Families is truly an excellent find indeed.